The Mando Footloose is a very different kind of electric bike. Instead of a traditional bicycle drivetrain, it has an alternator in the cranks of the bike that converts your energy into electricity to power the motor of the bike! This is a paradigm change in the e-bike world for sure. It is a clean and simple design. It removes all of the typical bicycle drivetrain components: the chain, chainrings, cogs, derailleurs, and shifters. This also removes the dirty, greasy chain! According to an electric vehicle expert I know, the series hybrid system could be a more efficient system compared to a traditional electric bike because it removes the efficiency losses from the traditional bike drivetrain. More on this in another post. The ride feel will probably be different. Pedaling “into” an alternator will most likely feel much different compared to the feeling of pedaling a bike on undulating terrain. 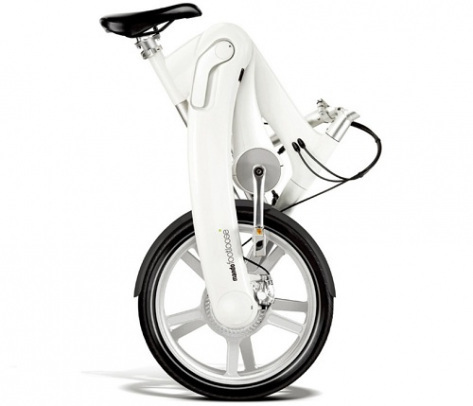 The Mando Footloose is also a folding electric bike that was designed to have very smooth aesthetic lines for style and safety from rough edges. Artificial intelligence gear shifting: automatically changes gear by detecting slopes, so you can cruise up to 21% hills effortlessly and comfortably without sweating. You are free from the constraints of having to adjust your speed or the timing of shifting gear with the Mando Footloose. Dual riding mode: Riding uphill is as easy as riding on flat land. The choice between using the throttle or pedals lets you travel the way you want – whether you want to pedal yourself or ride around more comfortably. Mando Footloose gives a unique experience where the rider gets to choose how energy is used. HMI with anti-theft system: Through the Human Machine Interface (HMI) mounted on the handle bar, you can check a wide range of information from range, distance, speed, battery and selfgenerated power status. It also monitors and self-diagnoses any irregularities. The drive and gear modes can be set to manual or automatic. The HMI is also portable, like an automobile smart key, and prevents theft as the Mando Footloose is immobilised when the HMI is removed from the handle bar. The Mando Footloose will be sold in Europe in mid 2013. No word yet on US distribution. Those are the details I have right now. I will add more as I get them. What do you think? Is the series hybrid e-bike drive the future for electric bikes? Please leave your comments in the section below. Unlike most e-bikes you won’t be able to ride this one home like a regular bike if an electrical component fails. Looks nice though. Hi Ken, I hope to have that info for you soon. I have a brother who needs transportation to try to get to hospital care. the light weight, he would be able to bring it with him into the doctor’s office. Can you let me know the price range in the white? work locally. Right now he depends upon me to help with transportation. I’d love to find out if this is feasible for me to get it for him. Hi Laura, I hope to have price info for you soon. Please note that the Footloose will be sold in Korea and Europe. I am not sure if it will be available in the US yet. Looks perfect. Any chance of it making it to the states? Hi Rishio, I am not sure yet, but I will keep you posted. I suggested to my neighbor who hopes one day to work full time in alternative energy that I didn’t understand if a battery could be charged by the wind turning what is essentially a wheel on a post why couldn’t an electric bike recharge its battery when one pedals. He said that would make it perpretual motion and that was impossible. So when they say the battery can be recharged by pedalling what do they mean? Hi Tom, the battery could be recharged if you are pedaling harder than is required to move at a certain speed. If for instance you are riding this bike at 5 mph and you are pedaling very hard (like you would be if you are traveling at 20 mph), then the surplus energy that you are creating in the alternator of the bike would then be used to recharge the battery. I have a feeling that most people won’t do this! I believe the normal scenario would be that you would charge up the battery at home and then go for a ride. If you pedal during the ride you will increase the range of the bike because you will be adding some energy (electricity) to the system and not solely relying on the energy from the battery pack. If you do not pedal during the ride, your range will be limited by the energy available in the battery pack. I hope that helps clarify how this type of “series hybrid” electric bike works. In my opinion, I don’t think this Mando Footloose will fly well with most bicycle and ebike enthusiasts. Good points Clayton! If the Mando Footloose is sold in the US I believe the max speed will be 20 mph. I love it! I want one. I just hope I don’t have to wait for the Chinese to make a copy I can afford. Very good ideas, the abolition of the mechanical drive system, concise, and easy to use. But I do not know the alternator and the rear wheel hub motor efficiency is how much? The rear wheel hub motor is a DC or AC motor? In rear wheel hub motor have any reducer or transmission? Whether PAS manner? The total efficiency of this electric car should be the product of the two efficiency. If the alternator efficiency close to the efficiency of mechanical transmission chain and sprocket will be very good. Hi David, all very good questions. It will be interesting to see the efficiencies of both the “series hybrid” system and the traditional e-bike compared in the real world. I am sure we will see some test results soon! I will have an article coming out soon to address some of these efficiency questions. ok, it gives a range of 28 miles, but if you are charging the battery by peddling why wouldn’t the range be as far as you want as long as you keep peddling? I do like the idea of peddling to charge the battery, but would this make it questionable under dmv laws of what class of motorized vehicle? You could have infinite range as long as you create enough energy (electricity in the alternator) to power the bike without dipping into the battery reserves. This would be like pedaling a heavy conventional bicycle (non electric). I believe Mando assumed that a typical rider would create a certain average amount of power during their ride (a comfortable pedaling effort) and that energy combined with the energy in the fully charged battery pack would provide the 28 miles of range. If the rider does not create any energy during the ride (no pedaling) the range would be limited to the energy available in the battery, which Mando claims is about 18.6 miles. Regarding the DMV, I believe that as long as the Mando Footloose provides less than 750 watts of power and does not go above 20mph, it should still be classified as a bicycle. That is IF the Footloose will be available in the US. I’m quite ‘blown-away?” — This is certainly thinking ‘outside the box,’ — a new design only possible in our modern times. Of course, as others mention, I don’t believe in perfect just because of a press release; products need to be time tested and the most obvious concern, already mentioned, is how you couldn’t ride home or pedal it anywhere if the system failed; one attribute of bikes I like; although if a chain break or a tire goes flat or your spokes break, etc., riding home is also impossible — and, after a few decades of use, I am beginning to feel more trust in electric/computer systems. Great points Citizenbfk! It will be interesting to compare the reliabilities between the 2 different systems when these types of “series hybrids” are available. Yes, I would like a full legal 33 kph (20 mph) but as an old man I seldom get my regular go-to-the-store bike much over 22 to 24 kph so I could accept the speed of this bike. And yes, I wonder about gears. On my two electric bike conversions I use 2 gears (even though they have 7 speed hubs). One low gear to help get started and one high gear to enable me to help at 30 to 33 kph and for exercise. 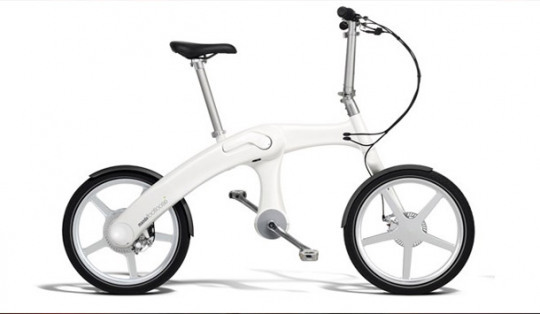 Remember this is a folding bike so if the battery runs down completely the bike is easy to fold up and take on a bus, taxi, or friend’s car to get home. And since it doesn’t have a dirty obsolete chain with sharp sprockets there is little chance you will damage your friend’s car. The article states that the bike will go on sale in Europe in 2013, where electric bikes are much more popular, but there is no indication of when or if this bike will be sold in the US. Hi Lynn, Great points; especially about the folding / no chain aspect of this bike. I hope to have more info about price and US availability soon. And you note they are all wearing backpacks if they want to carry anything. There’s no place to put a basket or panniers. Not so practical for in-town run to the store, or even go to work. I think I am very interested in buying one when available- I have not noticed headlights or taillights? Odd not to have on such a slick bike? What a fantastic product. It’s so great to be a part of an industry with so much potential. This bike is clearly a “designers” idea of what bicycle transportation should look like. That’s not a bad thing if you’re buying a bike to hang on your living room wall. I’m sure your friends would be impressed with your good taste in personal transportation. 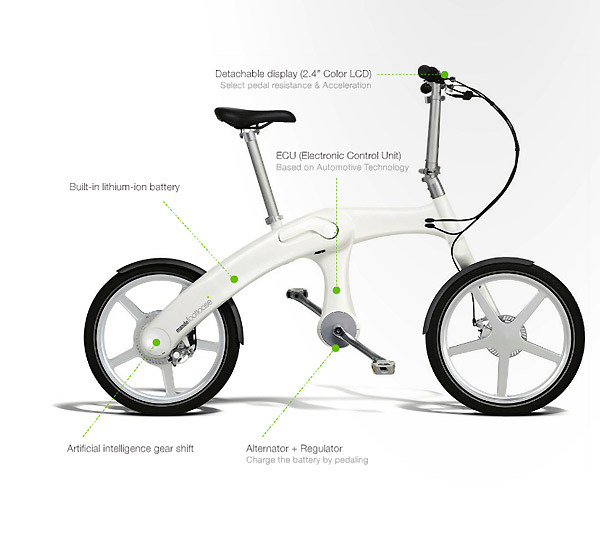 However, any e-bike has limited usefulness if it merely “looks good”. So, let’s consider what we actually know about the Footloose beyond its elegant appearance. The 36V-8.2 AHr Lithium battery is a definite plus in terms of weight. On the negative side, the specific Lithium chemistry chosen for the pack is not mentioned in any literature I’ve seen. Never the less, it’s likely to be a major contributor to the retail price, and is unlikely to be either serviceable or modifiable by the owner. Including its 7 or 8 pound battery, the Footloose weighs in at ~41 lbs. This seems a bit on the hefty side for an aluminum and carbon fiber bike of this small size. But that aside, it folds beautifully, compactly, and easily into a package that will store nearly anywhere. This is certainly a selling point for those wanting to take a bike with them on vacation, or who live in upstairs apartments. To an engineer, the technical specifications – actually, the lack thereof – presented in the above literature are wholly inadequate for any meaningful performance evaluation. Simply brandishing the exotic term “series hybrid” is of little consequence if there are equally good and cheaper ways to get the same horsepower to the road. Efficiency is another technical term, often improperly used, that’s designed to impress the potential buyer. However, what’s highly efficient in one set of conditions may be wholly inappropriate and inefficient in others. It’s the details – the specific application – that determines the appropriateness of a given technology. Even considering the elegant nature of the Footloose hybrid drive, I’m hard pressed to believe that it’s more efficient than a parallel hybrid system employing user activated regeneration under real world operating conditions. The key to understanding the difference between the systems lies in the nature of regeneration. Only if you’ve pedaled a bike lashed to a generator will you understand exactly what I mean! I won’t go into detail in this comment, but the human energy – that is, the pedaling effort – needed to simply EQUAL the motor’s current draw from the battery at 15 MPH will be greater than that required to pedal the same bike without ANY drive system at the same speed. This simply means that unless you are in good shape, or trying to get in shape, your battery will be constantly losing energy during your ride. True, you’ll be replenishing SOME of that energy through your efforts, but only a small fraction. 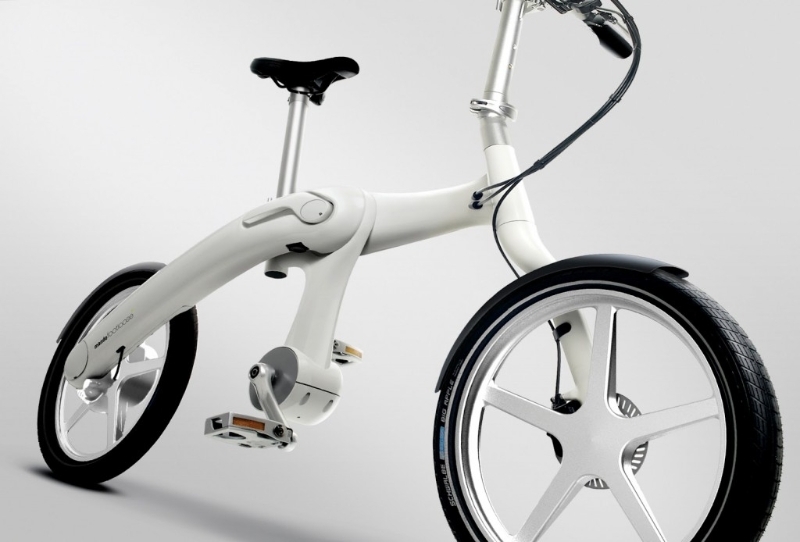 In other words, a series hybrid e-bike is a workout bike with a motor for when you get tired. Sounds like any other e-bike, doesn’t it? As to efficiency: Just how efficiently can your pedaling effort be converted into stored energy in the battery pack? That’s a difficult question to answer without more specific technical information about the Footloose. One thing for certain, it’s well under 100%! In fact, it’s WAY under 100%. Numbers in the low to middle teens come to mind from years ago, but I can’t say for sure what’s been accomplished since I began working with e-bikes back in 1996. I’ll be interesting to see if the company releases meaningful data on the performance of their system in the near future. Summing up: I see the Footloose as “Hammacher Schlemmer” catalog offering aimed at the well-to-do, and with a price to match. Could be wrong, but that’s my guess. Granted, if you have the money it’s a great machine to pull out of the trunk and ride around the city, or for boaters to carry on shore for a trip to the local pizza shop. To me it’s more of a hybrid pedalec, a type of e-bike I’ve never really liked. Maybe it’s my old motorcycle riding days, or maybe it’s just my familiarity with the more tinker friendly power-on-demand style e-bikes I’ve always built. Maybe it’s just that I’m getting too old to adopt new ideas. Who knows for sure – but I can see another Nova Cruz Voloci coming to market. Sounds like a well-considered assessment (above). Just because it’s new doesn’t mean it’s great and like many other folks I’d like to have ‘real world’ results and input from actual users before just accept Press Release promotions. It would be very interesting too have reviews from those who have ridden both a Footloose and an N360 equipped folding hybrid electric bike! This approach may be the future, but I suspect that a marriage of the electronics and mechanical marvels will be the market winner!